Even as it engages in nuclear negotiations, Iran continues to arm and train Hizbullah, Hamas, and Palestinian Islamic Jihad. Central to the Iranian effort are rockets and missiles (surface-to-surface), as well as UAVs and advanced anti-aircraft weapons, mainly for Hizbullah, intended to constrict the Israeli Air Force’s maneuvering room in Lebanon. Under Khamenei’s direction, Iran views the Palestinians in Gaza and the West Bank as a single unit under the leadership of Hamas. 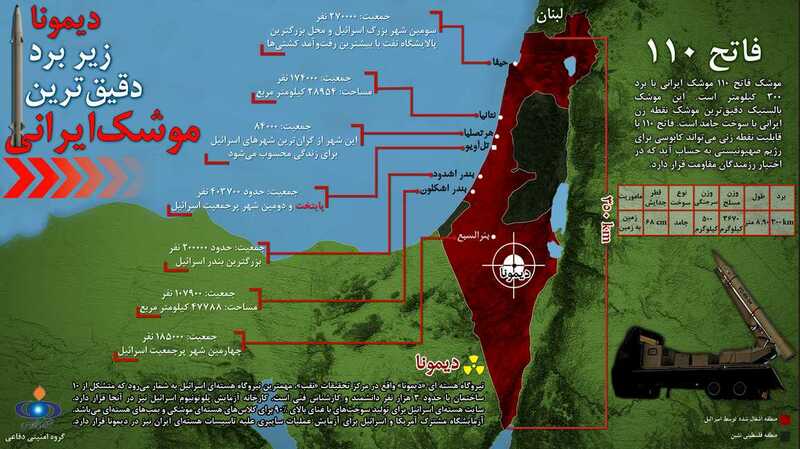 Iran seeks to encircle Israel from the north (Hizbullah), the south (Gaza), and the east (the West Bank) and to turn the rocket threat into an unbroken ring around Israeli territory. Iran views itself as setting the stage – on the propaganda, ideological, and military levels – for an inevitable confrontation with Israel and the West. In recent months, parallel to the key stages of the nuclear negotiations, Iran has completely removed the secrecy surrounding its provision of rockets and missiles to anti-Israeli terror organizations. Today, Iran frequently and publicly acknowledges this assistance, with no fear of the West’s reaction. In Iran’s eyes, Operation Protective Edge, the latest round of fighting between Israel and Hamas and the other Gaza-based Palestinian organizations, provided further proof that its long-term investment in supplying rockets and know-how for their manufacture to Hizbullah and Palestinian organizations is bearing fruit. As the end of the time allotted for the nuclear talks drew near (before it was decided to extend them again to June 2015), Supreme Leader Ali Khamenei and other senior Iranian officials made threatening statements about Iran’s rocket and missile capabilities and those of the organizations it supplies – indicating that in light the possible outcomes of the nuclear talks, Iran’s fears of an Israeli attack had grown. Iran does not obscure its security concept but rather gives it public expression. Lebanon, Gaza, and the West Bank form inseparable components of this doctrine, which Iran updates from time to time. In Iran’s view, the steadily developing rocket capabilities of both Hizbullah and the Palestinians – capabilities that Iran, with Khamenei’s encouragement, is striving to extend to the West Bank as well – constitute a main element of the deterrence against Israel that Iran seeks to develop. The aim is to deter Israel from attacking Iran’s nuclear facilities – or, if Israel nonetheless decides to attack, to use these rocket capabilities as a key part of its retaliatory response. 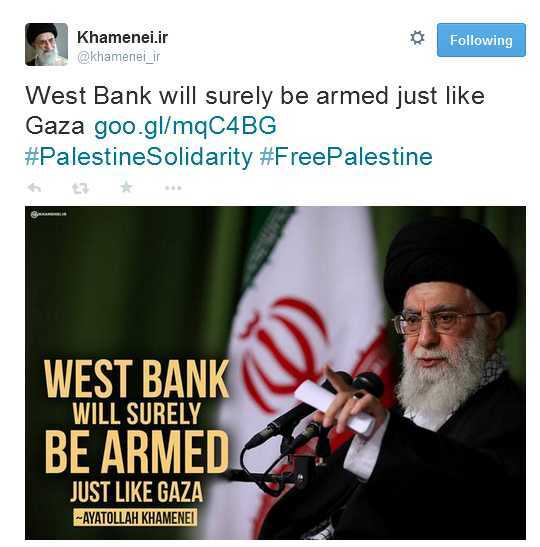 In this context, under Khamenei’s direction, Iran views the Palestinians in Gaza and the West Bank as a single unit under Hamas’ leadership. Consequently, Iran is gradually improving its relations with Hamas after they hit a nadir with the eruption of the Arab Spring in Syria and the removal of Hamas’s headquarters from Damascus. Iran now hopes that Hamas will rule the West Bank as well as Gaza, and will develop similar capabilities in the West Bank to threaten Israel. From a broader perspective, Iran, as statements by its senior officials suggest, is working to encircle Israel from the north (Hizbullah), the south (Gaza), and the east (the West Bank) and to turn the rocket threat into an unbroken ring around Israeli territory. A few hours before the most recent alleged Israeli attack, Russian President Vladimir Putin’s special envoy to the Middle East, Mikhail Bogdanov, met with Hizbullah Secretary-General Hassan Nasrallah as part of the activities marking the seventieth anniversary of Russian-Lebanese diplomatic relations. Iran, Russia, and Hizbullah have a common interest – the survival of Bashar Assad. To that end Hizbullah is paying with hundreds of casualties on Syrian soil, but it is also gaining greater access to advanced weapons from Iran and Russia, some of which it is trying to transfer to Lebanon. On another front cultivated by Iran – Gaza – about a week after the attack in Lebanon that was attributed to Israel, and during a rally on December 14, 2014 to mark the anniversary of Hamas’ founding, Hamas spokesman Abu Obeida specially thanked those who had aided the organization during Protective Edge and “first and foremost Iran, which was unsparing in its financial and military and other assistance and provided us with missiles that pulverized the defense of the Zionist enemy and with antitank weapons that shattered the myth of the Merkava tank.”3 During the rally, Hamas showcased a UAV of the Ababil model (developed in Iran) as well as advanced sniper rifles it had received from Iran. IRGC’s aerospace commander Hajizadeh’s deputy, Seyyed Majid Mousavi, said that Palestinian and Lebanese (Hizbullah) resistance organizations possess Fateh-110 missiles developed in Iran, and that Hassan Tehrani Moqaddam, the head of the IRGC Missile Research Center who was killed in an explosion in 2011, had helped these organizations develop their capabilities in the missile and rocket field. Mousavi claimed that given the range of these missiles, the organizations can now hit targets in all parts of Israel from north to south. He further remarked that some of the capabilities (involving the use of the Fateh-110) are under wraps and they will be put in action when the time comes. Musavi added that the Fateh-100 is manufactured in plants in Syria that were built by Iran, which also trained Hizbullah and the Palestinian organizations in its use and manufacture. These organizations, according to Mousavi, have become very skilled in this area.21 Iran periodically upgrades the Fateh-110 mainly for accuracy. In sum, at the same time that it engages in the nuclear talks, Iran continues to arm and train Hizbullah, Hamas, and Palestinian Islamic Jihad. Central to the Iranian effort are rockets and missiles (surface-to-surface), as well as UAVs and advanced antiaircraft weapons, mainly for Hizbullah, intended to constrict the Israeli air force’s room for maneuver in Lebanon. Other weapons Iran provides include antitank weapons, sniper rifles, mortars, and more. This issue, along with the issue of human rights in Iran, is not part of the nuclear talks and Iran maintains a resolute refusal to discuss these subjects. The West, for its part, does not want to “pressure” Iran and seeks to avoid “complicating” the already complicated negotiations. Decision-makers in Tehran are creating a direct link between progress in the nuclear negotiations and the effort they are investing in supplying advanced offensive rocket capabilities to Hizbullah and the Palestinian organizations that operate in Israel’s vicinity. The various spokesmen now highlight what they preferred to keep secret in the past: that they view Gaza and Lebanon, and ultimately the West Bank as well, as part of Iran’s envelope of defense, deterrence, and response with regard to its nuclear program. Thus, Iran promotes the goals of a Hamas takeover of the West Bank and the strengthening of the anti-Israeli rocket capability, via assistance to Hizbullah and to the Hamas Quds Force. The tense relationship between President Hassan Rouhani and the IRGC plays an important part in the externalization of the threats to foreign actors, as the IRGC tries to signal that it is not Rouhani who sets Iran’s policy in the domain of foreign relations and exporting the revolution. Recently it was also reported that the IRGC is maintaining a kind of shadow cabinet to counteract the Rouhani government, with former ministers of Ahmadinejad’s government as members. The matter was brought to Khamenei’s attention, and he chose to ignore it. The IRGC and Khamenei also support the “militant economy.” The dramatic decline in oil prices to less than $60 a barrel has further intensified the internal struggle and has worsened the difficult budgetary straits (the Iranian budget is planned according to revenues of $130 a barrel) that hamper Rouhani’s ability to advance the welfare policy he promised Iranian voters. The weakening of the American presence in the Gulf and the strengthening of Iran’s influence in Iraq, Syria, and Lebanon, along with the Palestinian organizations’ successes, from Iran’s perspective, in the recent rounds of conflict with Israel, inspire great confidence in Iran. In the window of time left until the nuclear talks expire, Iran is likely to escalate its declarations while on the ground boosting its assistance to the “resistance front.” Iran views itself as setting the stage – on the propaganda, ideological, and military levels – for an inevitable confrontation with Israel and the West.